Valentino fragrances are designed as couture objects: exquisite and timeless, they pay tribute to precious Italian ingredients with a modern twist. Valentino Donna is no exception to this. Launched in 2015 described as a smooth chypre-floral, it is elegant, sensuous and independant. Donna is a huge hit here at Scentstore, voted as one of our top favourites. With opening notes of Bulgarian rose blended with Italian bergamont and encased by intense notes of leather, patchouli and vanilla which gives softness and earthiness. The dry down reveals a classy bitter fragrance. The more you smell it you realise it’s a little rough round the edges. I’ve never smelt anything like this before. Being neither too quiet or too loud this scent is wearable by all women of all ages. The bottle hold’s it’s own, a heavy crystal bottle encrusted with pyramids and the pink liquid glistening through, just adorable. Donna comes in 30ml, 50ml, 100ml Eau de Parfum. There are also a range of frangranced body products to induldge in. Jimmy Choo eau de parfum is simply stunning, such an elegant and powerful scent for a women to wear, it’s my all time favourite. The fragrance itself is a sensual chypre fruity, with top notes of sweet Italian orange and juicy pear, heart notes of tiger orchid, and bottom notes of Indonesian patchouli and delicious toffee…Gorgeous! The design of the bottle is inspired by Murano glass, with a sleek black and silver cube lid, falling down into a shiny dusty mauve sphere. The packaging of the fragrance is a pink and black python print box, which is a classic representative of the brands heritage, Jimmy Choo have always used exotic prints in their luxury designs. Describes as “A fragrance enveloping the woman with sensuality and seduction, with warm, rich and woody depths. Inspired by modern women – strong, empowered, beautiful, seductive and alluring with a mysterious sense of confident sensuality” this perfume is one you can’t afford to miss out on. Wear this sweet and fruity scent for any occasion, day or night, it’s the perfect smell to turn heads and make you feel glamorous and confident. Use the Jimmy Choo body lotion to compliment the fragrance of the perfume, making your scent last longer and leaving your skin feeling silky smooth. This fragrance is available in both eau de parfum and eau de toilette for those who prefer a lighter spray. Available in 40, 60 and 100ml Eau de Parfum Spray. The delicious juicy sour cherry hits you first,followed by orange blossom, sweet vanilla and almond with a musky dry down. It’s like eating fruity sorbet on a warm evening, laughing with friends as the sun sets in the Mediterranean sky. Its sparkling, modern & playful and I fell in love with this fragrance at first sniff. Launched in Spring 2017, the fifth fragrance in the Prada Candy collection. It matches the glossy pink bottle with gold piping perfectly. 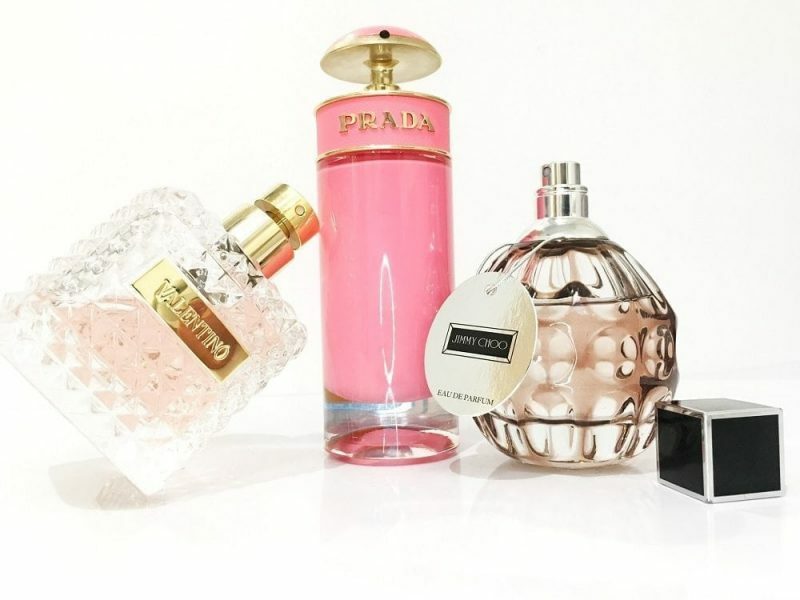 I find the longevity strong and it’s a must for your fragrance wardrobe! Available in 30,50 & 80ml Eau de Toilette Spray.